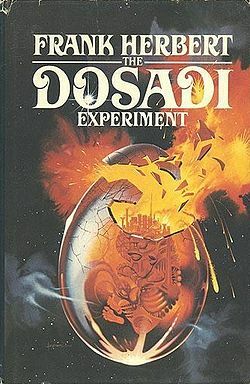 Might it be The Dosadi Experiment? There's sort of a sphere on the cover. Generations ago, a secret, unauthorized experiment by the Gowachins was carried out with the help of a contract with the Calebans. They isolated the planet Dosadi behind an impenetrable barrier called "The God Wall". On the planet were placed humans and Gowachin, with an odd mix of modern and old technology. The planet itself is massively poisonous except for a narrow valley, containing the city "Chu", into which nearly 89 million humans and Gowachin are crowded under terrible conditions. It is ruled by a dictator, many other forms of government having been tried previously, but without the ability to remove such things as the DemoPol, a computer system used to manipulate populaces without their consent or knowledge. The culture of ordinary day-to-day power in Dosadi is very violent. Among other tools, addictive psychotropes are used for handling power among hierarchies in organisations. But she did not really consider herself an angel or her weapon a sword. Her real weapon was an intellect hardened and sharpened by the terrible decisions her planet required. Emotions were a force to be diverted within the self or to be used against anyone who had failed to learn what Dosadi taught. She knew her own weakness and hid it carefully: she'd been taught by loving parents (who'd concealed their love behind exquisite cruelty) that Dosadi's decisions were indeed terrible. Her companion, Jorj X. McKie, is the leading "saboteur extraordinary" in the Bureau of Sabotage, and is never labeled as a doctor. For the humans investigating Isis, a lungful of air, the briefest of touches, an encounter with a single example from the vast array of native micro-organisms, would be fatal, inducing within a matter of hours intense haemorrhagic illness and a painful and gruesome death. With scientists' dark humour, the researchers call two of their outposts on the planetary surface, Yambuku and Marburg, after the first two strains of haemorrhagic fever that went on to devastate 21st Century Earth. Zoe Fisher, cloned by one of the Trusts, abandoned in an Iranian orphanage only to be rescued again, is more adapted than any human to survive in the wilds of Isis. Where others need bulky bioarmoured suits for any excursion, Zoe can leave the secure dome in only a membranous body-suit - both suit and genetically-modified Zoe are among the novel technologies being tested on Isis. Bios presents an enthralling tale of planetary investigation, scientific endeavour at the mercy of both the political machinations of the power-plays back in the Solar System, as Family-led Trusts vie for power, and individual whim. For, right at the start, we witness a surgeon making a final rebellious gesture against the establishment before she retires: during a routine surgical tweak to Zoe's configuration, she removes a vital augmentation, a gland that controls extremes of mood and emotion. The effects will be slow to kick in, but they will mean that Zoe will learn to fear and care and, even, to love, when she arrives on Isis. What's this book about a girls coming-of-age tale οn another planet? What is the title of a story with a little girl alone on a generation ship with a robot?